Few things present more of a danger for house fires than creosote buildup in a stovepipe. This black, tar-like substance is released from burning wood. Creosote is composed of unburned wood particles, ash and gases, all of which are highly flammable. Few things present more of a danger for house fires than creosote buildup in a stovepipe. This black, tar-like substance is released from burning wood. Creosote is composed of unburned wood particles, ash and gases, all of which are highly flammable. When the pipe becomes clogged, heat and smoke move sluggishly and may even get trapped. If an ember flies up into the pipe, a fire is likely. Thus, the moment you notice creosote, it must be removed. Light a fire in the stove using only very dry wood; this produces very little creosote and very hot temperatures. Keep an eye on your temperature, as you need it to be above 300 degrees F.
Once the fire gets going, puff in the powder chemical catalyst above the flames, following the instructions on the bottle. This product is available at most home improvement stores. Repeat this process for about two weeks, making a fire as often as possible during that time. After two weeks, attempt to brush out the creosote. ; it should have broken down to a form that an ordinary brush will remove. If not, repeat the process another week. Severe cases may take more than a month to clear. 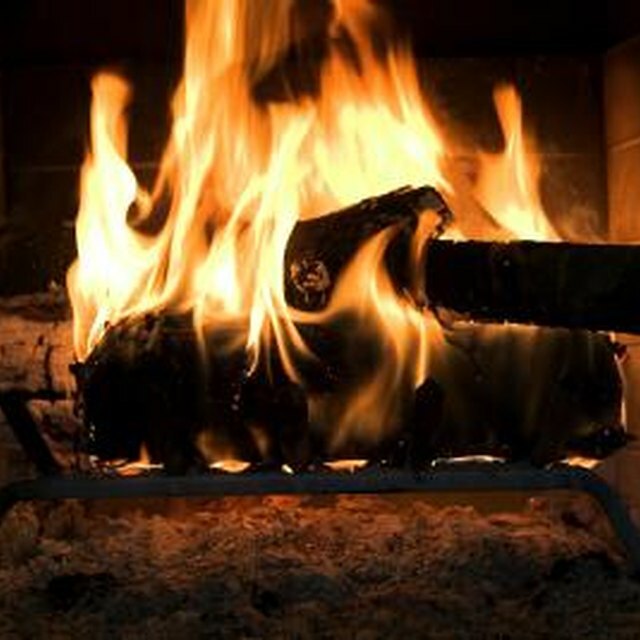 Each time you have a fire after removing the creosote, spray a few pieces of firewood with a liquid chemical catalyst. Follow the instructions on the bottle. Don't be afraid to call a professional inspector and cleaner. Some severe cases may require this, as a professional has access to stronger catalysts not available on the market. Do not attempt this if your stovepipe is more than 75 percent clogged. Call a professional instead. Use proper safety measures when handling the catalysts and the fire. Do not leave the fire unattended. Does Wood Ash Add Acidity to Soil?